Google has unveiled Android 4.4 KitKat as a fairly big update to the world’s most popular platform, but question remains: when will you be able to get it on your device? It’s a tricky one as always with Android, but we try to keep you up to date with the update schedule for different devices. *We will be updating this post continuously as new information comes in. Last in: All major flagships have been updated to Android 4.4 KitKat as of the beginning of June (most were updated earlier). We've entered the phase when second-tier and older devices are starting to get bumped to 4.4. Last update: June - 11th - 2014. The improvements in Android 4.4 KitKat come mostly under the hood. Google claims that it has made huge optimizations to the platform and its core apps, so even devices with 512MB of RAM (the overwhelming majority of Androids across the world are actually low-end devices with 512MB of RAM) can have a satisfactory, smooth Android experience. 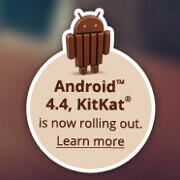 The new Android 4.4 KitKat however still seems to be coming first and only to the top-shelf devices. Here is the list of phones we know will get the update, and we have added a timeframe for its arrival for the phones that we know. Some of the information comes straight from the manufacturer, and update info for others is just based on rumors, so we've tried to make it clear what is the case for each phone. If you are wondering whether a device that is not on the list will get KitKat, let us say that chances are the manufacturer has either not yet announced plans for the update, or - sadly - the device will not get the updated. Which version of Android is your device running on? If the HTC One Google Play edition is getting the update in 15 days, it might be the same with the Nexus line and the S4 Google Play Edition then. Maybe in November or December. Why are you still on 4.1.2? Note II has 4.3 available. flagships are meant to be few in number. Only sony keeps popping out flagships every month fot no reason. If every phone is a flagship then whts the meaning behind it? And ig u really think samsung is bad in updating its phones you need to do a serioud fact check immediately. Yeah. I got the OTA for KitKat on my Sprint Note 3 yesterday. PhoneArena the HTC Butterfly S has been updated to 4.4.2 already too if you want to add it there. ive been rocking 4.3 on my VERIZON n2, for about 2 weeks now. my wife's VERIZON s3 updated to 4.3 a good two days before me. Actually not Samsung's fault, its Texas Instruments. Of course, if the battery in your Sammy phone explodes, it's not Sammy's fault, but some nameless one's who sold the batteries to Sammy. PapaSmurf, kids under 12 are not allowed to use that word. Plus I've got copy rights on that word...and I use it mainly for 'sammy' fans. Nothing from what he said makes him an android hater. Ex: Should I remind u how judgemental you're comments are when htc gets banned because of an infringement from a hardware done by a dif manufacturer ?! Ohhh yes it's htc's fault...they should know better...well yr sammy should know better as well before they decide to put a crappy processor in a phone...especially a nexus phone that is meant to be compatible for upgrades for a long time. Yes GALAXY NEXUS is a fail. Ta da.